As your State Representative, I want to make sure to keep you as up to date on the latest news and notes that affect the workings of Illinois government. 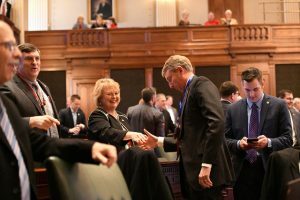 I plan to use this space as we This past week was a very busy one in Springfield, as legislators were in town on Monday and Tuesday for two final ‘lame-duck’ Session days in the 100th General Assembly. Two items were on the agenda for consideration. The first would allow for a change in the appointment schedule for new Board members of the Illinois Tollway Authority. 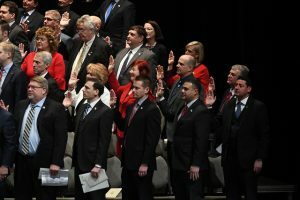 The current board is set to retire in May of 2019, and this piece of legislation would allow the incoming governor the opportunity to start the appointment process once he takes office. It is a common practice for incoming administrations to make their own appointments to various boards and commissions. I voted in favor of this legislation to give the new governor the ability to appoint a new Tollway Board. The second issue dealt with raising the pay of incoming administration officials by 15%. There were many reasons I voted NO on this legislation. First of all, we have one governor at a time. If Governor-elect Pritzker thinks it is so important to pay higher taxpayer funded salaries to his employees I believe he would have been better served to say so once taking office. The behind-the-scenes influence of the Governor-elect is something that I found disturbing. I also did not think that raising bureaucratic pay by more than $22,000 per year sends the right message to taxpayers that are already on the hook for billions in unpaid bills and pension liabilities. These incoming officials are as-yet untested, and to me it seems egregious to reward officials for results that they have yet to achieve. A 15% pay raise is almost unheard of in the private sector…how many hard working folks would love a 15% pay raise? Despite my strong objections, the legislation passed the House and Senate and will likely be one of the first items signed by incoming Governor-elect Pritzker. On Tuesday, I joined Tom Miller on the WJPF Morning NewsWatch for an interview to preview the week that was to come in Springfield. You can click the link below to listen in! Springfield…On Wednesday, State Representative Dave Severin and 117 other members of the Illinois House of Representatives were sworn in to serve as members of the 101st General Assembly. As he begins a 2nd term as State Representative, Severin said he is both optimistic and focused ahead of starting the upcoming Session. Severin was re-elected in the November 2018 election to a 2nd term. The 117th district includes all of Williamson and Franklin Counties and some parts of Hamilton County. 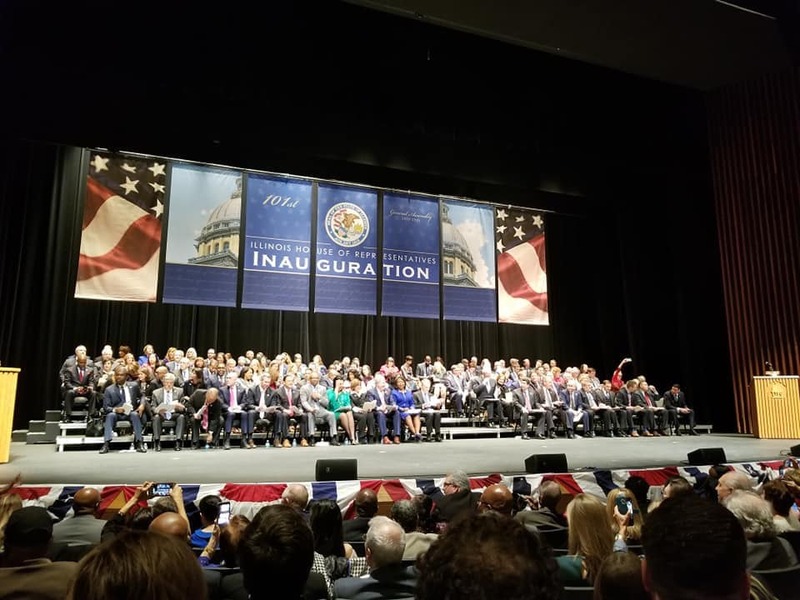 “I want to thank all the people of the 117th district for entrusting me with this responsibility for a 2nd time, and I want to make it clear that I will be focused on a legislative agenda that stops outmigration, expands our economy, and balances our obligations with our abilities,” Severin said. 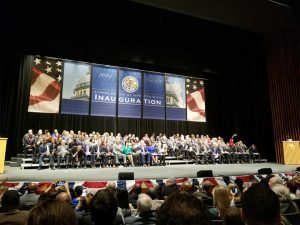 “I believe the incoming Governor has been rightly focused on striking a bipartisan tone and I hope he realizes that the problems we had when Governor Rauner was in office are largely still the same now. Last week I announced that my district office in Marion is changing locations. Our new office is located at 600 Halfway Road, Suite 103 in Marion in the Futiva building. You can reach my office by calling 618-440-5090 or by visiting RepSeverin.com and clicking on the contact button. I want to invite you to attend our new district office Open House from 10:00 a.m. to 1:00 p.m. on Tuesday, January 22. I will be available to meet with constituents and to introduce my staff to the public. I look forward to seeing you there! As always, God bless you and God bless the State of Illinois!